labs: Maya x_x. . . | andrewANDORU. 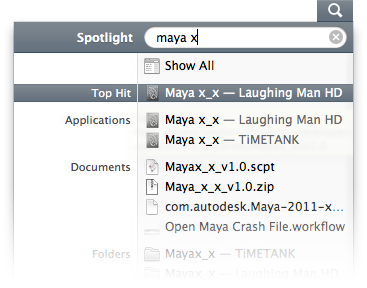 . .
Maya is an application that can sometimes crash. It is always due to user-error of course, but for those moments when your pathetic human brain is unable to keep up with the technology, Maya x_x is there for you. Maya x_x is an AppleScript application based off of a fantastic shell script written by Dave Girard to easily open the recovery file Maya generates when it crashes. The clever bit of this app (the shell script) takes a look in your /var/log/system.log file for “Fatal Error”, a string of text that is common to all recent versions of Maya when a crash is detected and a recovery file is saved, and pulls out the proper path of the newly generated recovery file. LIke this. . .
. . .not exactly any easy file to find if you have to go digging around yourself. Maya x_x also checks that output to see which version of Maya generated the crash log, and opens the recovery file in the appropriate version of the app. It also gives you a simple app to throw in your utilities folder (or wherever you like), that you can easily call up from Spotlight by typing Cmd+Space, and “maya x”, and pressing return. This is designed to work with Maya 2009-2011, and as long as Maya actually generates a recovery file, all should be well. While this won’t automatically close any scene you currently have open but it is a good idea to just use this app right after the crash occurs, and always make sure to give the recovery scene a once over to make sure nothing is out of the ordinary. Download: Maya x_x download page. . .
To answer some questions in advance, After Effects and Nuke have pretty decent crash recovery and automatic save systems build right in. After Effects will even put up a pop-up showing where the recovery file is saved. There is a great tool called AE Suicide that will force AE to crash more elegantly and hopefully generate this recovery file. Nuke’s built in autosave system does the job just fine, and Nuke rarely crashes.